LiquidPlanner is a different way of managing your work and there are some fundamental things you need to know before you dive in. It might feel a little different at first, but once you get going, you’ll find that our way of project management is more natural to how people really plan and prioritize their work. Start every day with confidence. Your team’s work and conversations are centralized in your workspace. It’s your one place for all projects, people, and priorities. When your organization’s priorities are all aligned in a single place, you can be confident that you’re doing the right work at the right time. When you first log in to LiquidPlanner, you’ll land on the Home tab of your workspace. You’ll see what’s been going on across the entire workspace, or you can narrow down the activity to just the things you care about. In LiquidPlanner, there’s a perfect view for everyone. 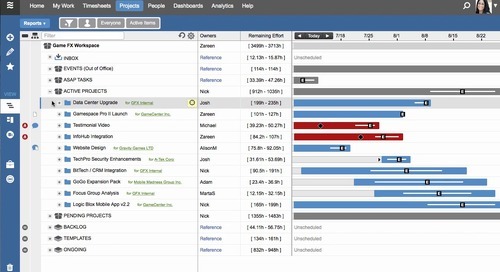 Project managers will spend most of their time on the Projects tab where they can filter down to at-risk items, see information quickly with customizable columns, and save favorite views. Think of it as an organized command center. Choose from Timeline, Baseline, or Card views. For project contributors, focusing on assigned work is paramount. The My Work tab lets task owners see their prioritized list of work and all of the important details without the noise and distraction of other things going on in the workspace – a truly Zen place to be. Keep a dedicated My Work browser window open throughout the day to make quick updates, log time, or add to-do items. Executives or external clients need a specific, tailored view of projects or an entire portfolio, and Dashboards deliver. Whether it’s high-level trends or nitty-gritty details, you can build a dashboard to show the right information to the right people. Watch the Crash Course or check out the Workspace Tour for more details on other views. Break it down with plan items. The Inbox is a place to put new work or items that needs to be reviewed before being prioritized and put into the plan. Packages are containers that are used to group projects and also to create priority overrides for individual tasks. Projects group together work for bigger initiatives that involve multiple people and complex workflows. Tasks represent the individual action items, or work, that needs to get done for the project. Events are used to block time for when you’re out of the office. Using events keeps your schedule accurate because it accounts for the time you won’t be spending on project work, like when you’re in Hawaii for some R and R.
For the full list, including milestones, check out the Introduction to Plan Items. Create a project from the Add Menu. Add tasks to represent the work that needs to be done for this project. Estimate the amount of effort it will take to complete each task. With that information, LiquidPlanner will calculate when the project will realistically be completed based on resource availability and workspace priorities. TIP: If your projects tend to repeat the same steps or workflow, you can create a designated template project and duplicate it whenever you need a fresh copy for an newly approved project. Drag and drop it like it’s hot. Things change. If you’re not able to adjust your priorities, your plan will be inaccurate from the moment you first build it. That’s why the creators of LiquidPlanner made it really easy to reprioritize work. When something bubbles up in urgency, just click on the hot item and drag it upwards. By moving the task to a higher position, you’re telling LiquidPlanner that the task should be scheduled sooner. Time estimation is a crucial skill in project management. But pretty much no one gets it right. That’s because single-point estimates are usually padded guesses that don’t capture the inherent uncertainty that’s a part of every project plan. Instead of saying a task will take 6 hours of effort, in LiquidPlanner, you’ll be able to provide a best case / worst case range of 3 to 6 hours. This dual-point ranged estimate enables LiquidPlanner to calculate a realistic range of possible finish dates so you’ll always know how likely you are to finish on time. Open the edit panel for a task. Click on the Estimate field. Enter a best case and worst case estimate, then click Save. It might take a bit of practice to get used to estimating in terms of effort, rather than duration. At first, people tend to underestimate the amount of effort a task will them. If you’re not sure how long a task will take you, it’s okay to enter a wide estimate, like 10-20 hours. As soon as you get more information about what the work entails, you’ll simply update the estimate and your schedule dates will automatically adjust. TIP: Ranged estimates on tasks roll up to projects and packages so you can instantly quantify scope. Keep in mind that rollups in LiquidPlanner aren’t calculated by simply adding up of all of the estimated hours; they’re statistically correct totals, which are a better representation of reality. Let LiquidPlanner take care of the schedule. To get an accurate schedule, all you have to do is place tasks in priority order, add ranged estimates, and track time as you go; LiquidPlanner’s scheduling engine will do the rest. When you log time to a task, that time is automatically decremented from the task’s estimate. This means LiquidPlanner iskeeping track of your progress as you go and giving you a schedule that always up to date. Schedule dates are automatically calculated for you, with the most important date being your expected finish, or Finish [E]. The Finish[E] is the 50% likely finish date and the one you should be shooting for. You’ll also see a number of other calculated dates around your workspace, such as the 98% likely finish date. This finish date, for example, might be the one to share with clients since this date comes with higher certainty. TIP: Because LiquidPlanner creates your schedule based on resource availability, there is no need to set up dependencies between items that are owned by the same person. Update tasks on the fly. On the Projects tab, open the edit panel by double clicking on any plan item. In most places around your workspace, including timesheets and dashboards, you can also open a stand-alone version of the edit panel by clicking on any item name. Use the edit panel to assign members, estimate work, track time, add comments, upload files, and tons more. Not a big mouse user? Check out our keyboard shortcuts. Changes made to fields in the edit panel will be saved automatically. If you’ve made a change that affects your schedule, LiquidPlanner’s scheduling engine will run in the background while you go on your merry way. All of your project dates will be automatically updated without any action from you – it really is that simple! If you’re curious to see how your schedule was impacted, just click the green Schedule Ready button that appears at the top of your workspace. TIP: New workspace members are often hesitant to make scheduling updates because they worry about “messing up the plan.” This fear can come from years of using old-school project management tools that require constant manual upkeep. With LiquidPlanner, there is nothing to fear! With a dynamic project management tool like LiquidPlanner, there’s no need for an undo button. Updates are instantly accounted for and you can make as many changes as you want. Did you accidentally estimate 300 hours instead of 30 hours? Simply update the estimate and LiquidPlanner will take care of the rest! All of your conversations, documents, and notes are in context with the work that you’re doing. Click on any plan item and you’ll see it’s collaboration content in the edit panel. Comments and documents roll up to the project level, and are searchable, so you don’t have to sift through items one-by-one to find the conversation you’re looking for. Since discussions are captured alongside tasks and projects, anyone can read through the history and get up to speed. Add a comment for any workspace member by using @username so that they’ll be notified. Or, get everyone in the loop by using @teamname or @all. Any tags or cross-references that you add within a comment will automatically be added to their respective sections of the edit panel as well. TIP: Want to get updates for a task, but you’re not an owner? Just follow it! Status, workload, and trend reports are available on the Projects tab and can be run on any plan item by any member. Just click on the View Menu (Timeline) and select a report. Or, add widgets to a dashboard to display multiple data sets in a single view or to share reporting information with external guests. Who doesn’t love the feeling of checking something off the list? When you complete work in LiquidPlanner, whether it’s a small task or a huge project, be sure to mark it done. This is also a good time to log your progress so that those hours will be reflected in reporting. Nice work! Now that you’ve got a handle on the basics, you’re ready to learn more of the key features and workflows of LiquidPlanner. 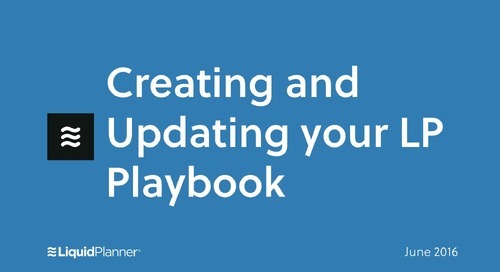 We know that learning how to use a new tool can be daunting at first, so we’ve created guides and videos that will help you get off the ground quickly. The Knowledge Base is where you can find detailed documentation on all of LiquidPlanner’s features. If you’re a visual learner and prefer to see things in action, be sure to check out the Getting Started video series. Use our Setup and Onboarding guides to create a plan for introducing LiquidPlanner to your team. The post Getting to Know LiquidPlanner appeared first on LiquidPlanner. Get a quick overview of LiquidPlanner in our Crash Course video.